Whether you're searching for someone to hire, or for someone to hire you, you're likely gathering information both from LinkedIn profiles and also from personal and professional blogs. You've worked hard to establish your personal brand via your blog, so it makes sense to showcase it right on your professional profile. The TypePad team that brought you Blog It has created an application to bring your blog and your LinkedIn profile together: Blog Link powered by TypePad. Blog Link is a free, easy-to-use application that allows you to connect your blog to your LinkedIn profile. The application displays a feed of your latest blog posts right into your profile, so you can extend your personal brand even further by sharing your thoughts and insights with your professional network on LinkedIn. One of the best aspects of LinkedIn is the network you can build, and Blog Link has you covered there as well. The "Your Network" tab in the application shows the most recent blog posts of people in your network, automatically finding their blogs as listed in their “Websites” list on their profile. And as more of your contacts add the Blog Link application, your own latest posts show up in more places. It's another great way to broaden and enhance your network on LinkedIn. Blog Link is powered by TypePad, and it supports all blog platforms, including TypePad, Movable Type, Vox, Wordpress.com, Wordpress.org, Blogger, LiveJournal, and many more. To learn more, visit typepad.com/bloglink and add the application to your LinkedIn account today. For a demo and more details on BlogLink, watch the video with David Recordon. David's our Open Technologies Lead, who's known for leading efforts around OpenID and OpenSocial, which powers LinkedIn Applications. Q. 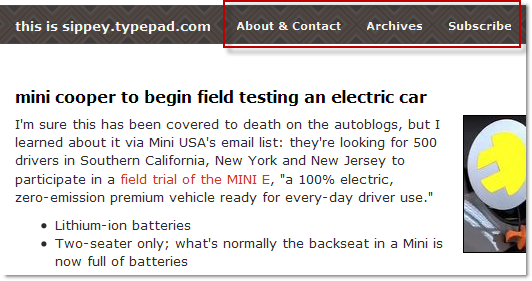 How will I know when I'm on the new TypePad? If you don't see the message, hang tight. As Ben explained in his post, moving accounts to the new system is a complex task, and we want to be sure we doing things carefully and methodically so you'll see little or no disruption to your service. 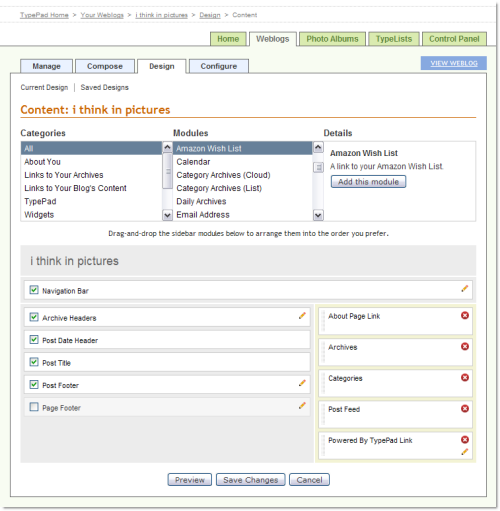 “Theme Picker: Brilliant and finally it is very fast to choose a design. Theme Builder: Love it!”. It’s now dead easy to pick a theme or to create a new one! Try it by yourself, by clicking on “Design” and them “Themes”. You may notice that we've replaced the "Convert to Advanced" feature with the ability to start from a generic Advanced Template set. We made this change for a number of reasons, primarily to make it easier for you to get started customizing your template. Based on your feedback, we’ve removed the hidden configuration steps and tags. All the code is exposed to you to simplify making changes and we've launched a new site with detailed documentation on template tags. There are more improvements to Advanced Templates coming soon, including additional Advanced Templates to start from, the oft-requested import and export function and much more. This feature will be made available to all users on the new platform over the coming week. 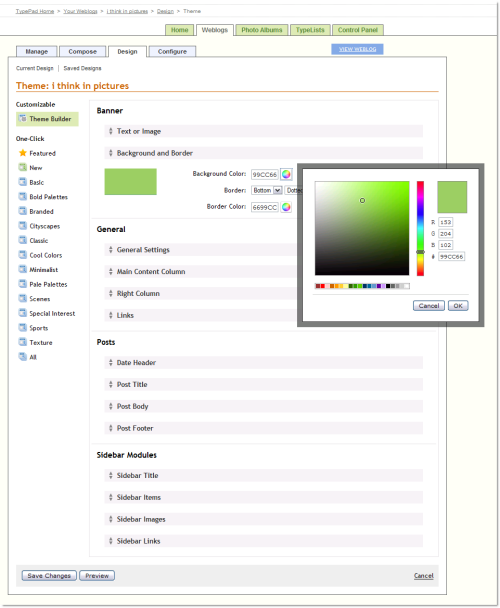 Update 2008-10-29: This Knowledge Base article explains how to use CSS to customize the style of the navigation bar. As we continue to celebrate TypePad's 5th Anniversary throughout October, we wanted to fill you in on the ongoing activities. Many of you have sent in your inspiring stories that we continue to showcase on the Celebrating 5 Years of TypePad page: from Katherine and Jon who met through their TypePad blogs and are now engaged to be married, to several successful business consultants, to mother of two Tara Frey who blogged her bliss all the way to a book deal. Chantal Hubert, whose blog is approaching its own fifth birthday, even wonders if blogging might be a bit therapeutic. You can read all their stories, in their own words, and submit your own stories and photos on the Celebrating 5 Years of TypePad page. We're also celebrating here at TypePad HQ in San Francisco with a fun get together next Thursday, October 30th. It's a casual gathering with Six Apart staff and bloggers on TypePad, Movable Type and Vox for snacks, music, meeting fellow bloggers and sharing stories. If you'd like to join us, please RSVP by emailing your name and blog URL to anniversaryRSVP AT sixapart.com with by October 24th. Space is limited, so please email us if you're interested in attending and we'll send you the details. October is a big month of birthdays here at Six Apart: TypePad celebrates five years, while Movable Type turns seven and Vox turns two. 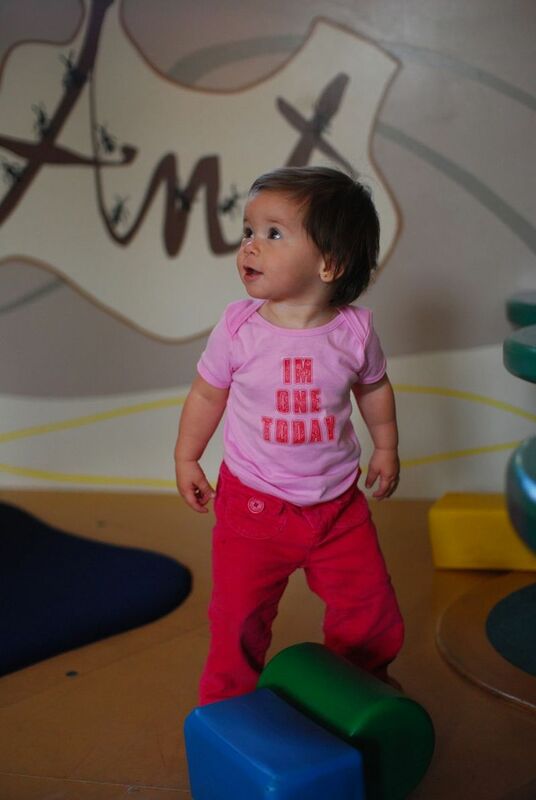 Even future blogger Penelope Trott, daughter of founders Ben and Mena Trott, turned one year old this month! To mark TypePad's fifth anniversary, we'd like to celebrate the personal and professional successes you've experienced over the past five years. In last month's TypePad newsletter, we asked you to share how blogging has changed your life, and we've collected a few of your inspiring stories on our anniversary page: Celebrating 5 Years of TypePad. On this page you can also browse photos from Six Apart staff and TypePad bloggers. We're lucky because every day we see how blogging changes and improves people's lives, and now we're thrilled at the chance to share some of these stories with you. Whether you're new to TypePad or you're old school, you can't help but feel good when you hear how bloggers have achieved their goals and dreams. Do you have a story or photo to share? It's not too late to get in on the fun. Submit your stories and/or photos and we'll update the anniversary page throughout the month. You can also celebrate on your own blog by grabbing the birthday badge widget below. Thanks to everyone who took the time to share their inspiration, and if you haven't shared your story or photos yet, submit them today! Want to make a difference in the life of a public school teacher and his or her students? Want to contribute to the education of the next generation of bloggers? For the second year in a row, Six Apart is participating in the DonorsChoose.org Blogger Challenge. The challenge starts today and ends on October 31st, and we'd love for you to participate along with us. Just as we did last year, Six Apart is sponsoring the award for the bloggers who reach the most kids. The Blogger Challenge is a friendly contest among bloggers to raise money for low-income public schools. Here’s how it works: teachers from all over the country post items they would like funding for, such as writing supplies for a journalism class, equipment for a science lab, or music instruments for a band class. Bloggers choose their favorite projects, and link to their challenge page in a post or via a widget on their blog where their readers can donate. The bloggers who raise the most money or reach the most kids will win an award. Congratulations to the many Six Apart community members who raised a lot of money last year, including NYC-based venture capitalist Fred Wilson of A VC, who raised $18,000 (see Fred's 2008 challenge), and a University of Minnesota biologist at science blog Pharyngula who raised $15,000. Many more bloggers in the Six Apart family are participating this year, including Finslippy (who promises to reenact Pat Benatar's video for "Love is a Battlefield" in its entirety if she wins), Silicon Valley Moms, and Scienceblogs.com, to name a few. Set up your own challenge and let your readers know in a blog post or by installing the widget (it just takes a few clicks). Have fun with it! We're tracking the friendly Challenge-challenge between TypePad bloggers Craig Newmark of Craiglist and Craig Newmark of Newmark's Door. Feel good about helping kids and teachers in low-income schools. Donors Choose will announce the results in early November, and we’ll reveal the winners of the Six Apart award for bloggers who reached the most kids. Are you going to accept the Blogger Challenge? Tell us about it (and link us to it) in the comments!